Wow! 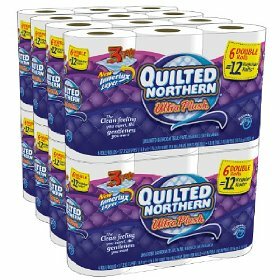 Hurry over to Amazon to score 48 double rolls of Quilted Northern for only $23.59 with free shipping! To get this price, you'll need to "clip" the $1 off coupon found on the page. You need to be logged into your Amazon account to see it. You'll also need to buy using Subscribe & Save, but you can easily cancel it as soon as your order ships via your Account Page. When you break down the price, it works out to $0.53 per double roll or only $0.25 per regular roll!